With beauty out of the way, let's talk about other fun stuff. Again, this is mostly a giant list of things I personally think are pretty cool, so if you need gift ideas for any tea-loving, gaming, homebodies in your life, you're in the right place! Of course I'm going to have a whole section dedicated to tea. David's Tea makes tea so fun and accessible whether you're young, old, new to tea, or a little further along. 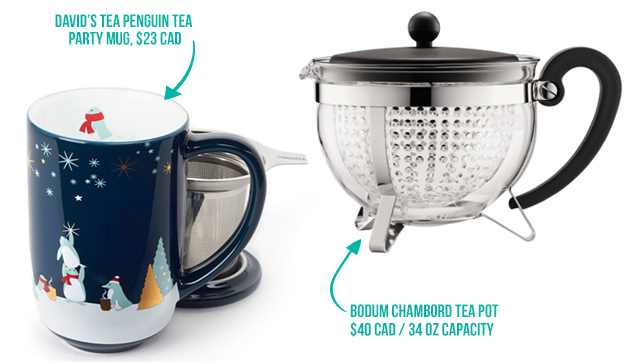 They have tonnnssss of gift sets right now for all sorts of tea lovers, but I managed to pick out a few favourites: the adorable Penguin Tea Party Nordic Mug ($23 CAD) and the Tea Of The Month kit ($26 CAD), which includes a nice assortment of teas. To make more than a single serving of tea, I have a Bodum Chambord French Press ($55 CAD for 17oz), well-built and meant for coffee but works great for tea: tea leaves get plenty of room to open up and release flavour, and the mesh filters out even teeny, finicky tea leaves like rooibos. But I just found out about the Bodum Chambord Tea Pot ($40 CAD) and it looks really cool. You get the roominess of the French Press, but with the option to remove the tea leaves when it's done brewing. Old Faithful is a neat little shop in the Gastown neighbourhood of Vancouver, and has a gift section on their site specifically "for the cocktail connoisseur", aka your hipster craft cocktail friend. 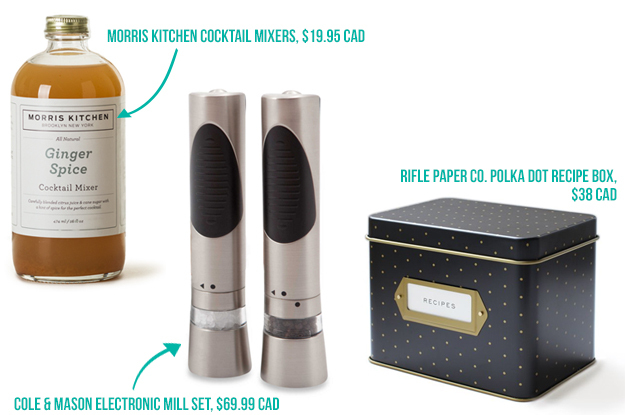 The Morris Kitchen cocktail mixers come in flavours like spiced apple and pineapple lime for $19.95, and there's a Barrel Aged Spirits Kit ($24.95 CAD) that seems pretty cool. I asked a good friend, who is a very talented cook and baker, what someone like him would want for Christmas (hi, D!) He mentioned Silpats ($24.99 CAD), which are actually pretty great: they eliminate the need for parchment paper in baking, and provide a non-stick surface to knead dough. He also mentioned battery-operated salt and pepper mills and I was all, "really dude??" And he sent me a picture of this Cole & Mason Mill Set ($69.99 CAD) he uses every day. This would be a nice small luxury for the cook in your life, and also D makes awesome food on the regular, so what do I know anyway. For the person who is a perfectionist about both cooking and organizing, there's the Rifle Paper Co. Tin Recipe Box ($38 CAD), which comes with recipe cards and dividers to organize them. I keep something similar with a plastic black box and index cards, but this option is obviously way prettier and gift-worthy. Giant squishy, cuddly animals. Need I say more? Okay, Squishables are even cuter versions of your favourite animals, and the original 14-15" sizes are perfect for wrapping your arms around when you are feeling sick and miserable in bed. I have the T-Rex, bought the Worrible and limited edition mini Kappa for bf, and the Great White Shark ($39 USD) would probably be next for me if I could make room for it! (They also come in mini, micro, and massive sizes to suit all cuddling needs.) Squishables are carried in retail locations too if you want to avoid paying for shipping. I love collecting bunny things, so I couldn't resist adding this Umbra Anigram Bunny Ring Holder to the list. For $8 CAD, this would be such a cute stocking stuffer, and it comes in white enamel too. Saje has quite a few nebulizers models to choose from, but Saje AromaGem ($69.95 CAD) is the most gift-able because of the modern and pretty faceted design and the mid-range price. The AromaGem expels a superfine mist of water and essential oils to gently perfume a home, without using heat. It's kind of like a candle you can refill again and again. (There is also a holistic aspect, if your giftee is a believer of the power of essential oils.) 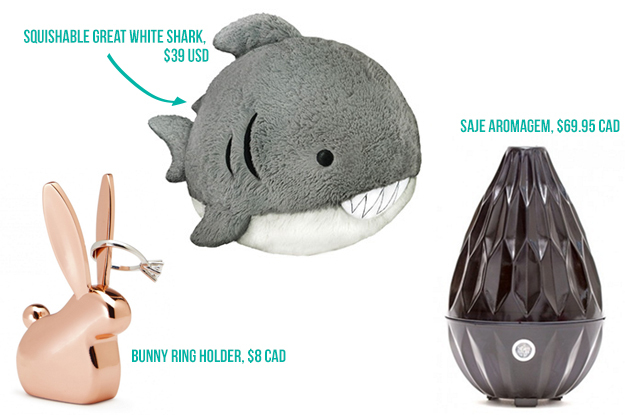 There's a pretty good range of Saje diffuser blends to choose from; the scents tend to be natural and earthy, perfect for someone that doesn't like anything that smells super artificial or cloying. Super Mario Maker on Wii U ($69.96 CAD) is goddamn genius. You get to create and play your own Super Mario levels, upload them to share with other players, and play other people's levels. Bonus nostalgia points because you can create them in the classic 8-bit NES style or with SNES graphics, in addition to modern Super Mario Wii U graphics. The whole thing is a test of your creativity and masochism. Uploading videos of runs on insane courses to YouTube is pretty popular--I found out about this game in the first place because MizzJ's husband was showing us videos of some mindblowing runs. "Gamers" include tabletop gamers too, you know! :P Pandemic ($41.54 CAD) is unique because it's a cooperative board game--as a team of CDC medical emergency specialists, you need to work together against the game itself to cure four diseases before they overtake the world. Winning takes a lot of communication, logic, and coordinating with each other (board game fun without the desire to take revenge on everybody that crossed you!) Alternatively, if you know a Pandemic superfan, spoil them with the recently-released Pandemic Legacy ($49.07 USD), which is intended to be a version that takes place over 12 months--real-time!--with permanent character deaths. There's a good explanation of it here. If you want to double down on the geekery, the Game of Thrones adaptations of Monopoly ($69.95 CAD) and Risk ($84.95) are pretty cool too. If you want to treat a PC gamer, a good gaming mouse might be a good idea. I don't have any recommendations because I don't play PC games that really need a gaming mouse (ex. StarCraft, League of Legends, etc), but this guide seems pretty solid. For someone that has more jewelry/makeup/stuff than storage space, check out some tutorials on making DIY tiered cake stands: this one only needs epoxy glue; this one requires a power drill but seems like it would be more sturdy. Lurk a thrift store or dollar store for cute pieces (bonus if they're charmingly mismatched) and add a tea cup to the top tier for extra adorable-ness. Also a good idea for holding, you know, actual baked goods or whatever, I guess. Love doing makeup and nails? Treat someone by giving them an at-home makeover or manicure. Being taken care of by someone else is always a lovely feeling, not to mention looking and feeling fabulous afterwards! That wraps up this post. I have one more gift guide to go, but I wanted to quickly switch gears and get this thought off my chest: even though there are lots of gift guides floating around this time of year (and I'm contributing to them :x), don't forget that in the end, it's just stuff. 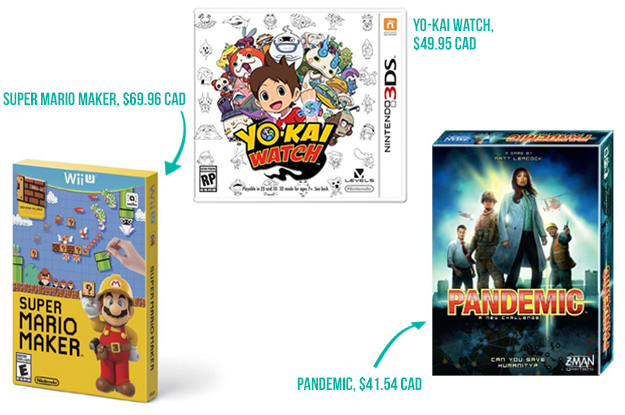 If you're on a tight budget this year, or can't figure out what to get, don't stress out so much. There is no gift as precious as spending quality time with your loved ones.